In the past I never really minded the products I treated my hair with: a store brand shampoo, shampoo containing silicons, parabens and so on. I have to admit that when I was younger I occasionally pampered my hair with nutrifying masques, using a conditioner only once a week. A visit to the hairdresser was cut back to once a year, while girls with my hair length should have dates with the hair magicians at least 3 times a year! 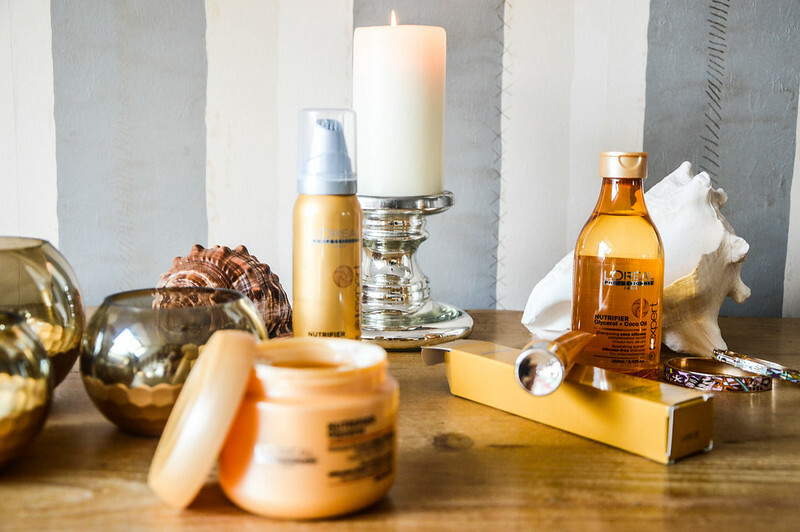 I wasn’t really aware of what the right products could actually do for you. The logic result was dry, frizzy hair without any volume. It’s been three years now that I sounded the alarm bells. I found my holy formula to treat my hair the way it deserves to be treated. 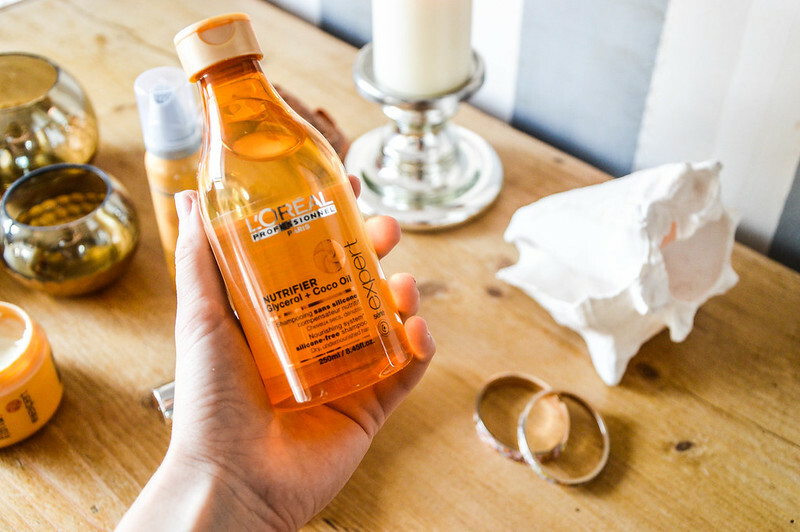 A few months ago, I received L’Oréal Pro’s new hair care gamut, which has become one of my ultimate faves in the bathroom. 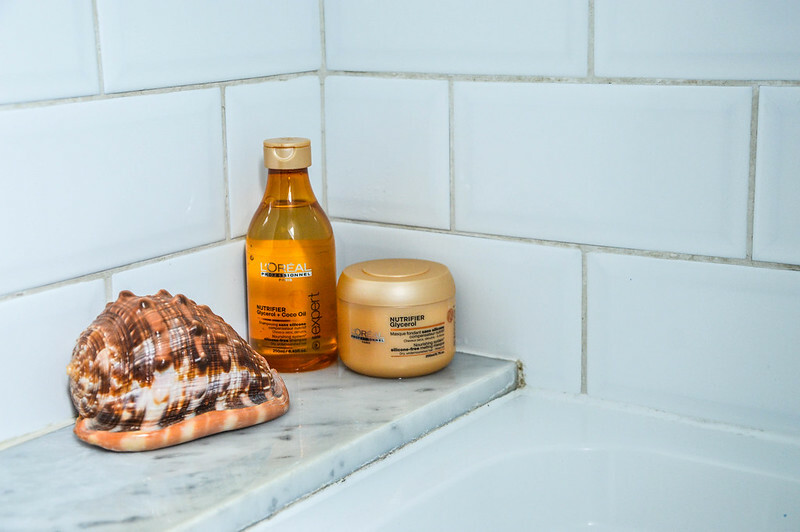 ‘Why ** should I put glycerol in my hair?’, I hear you think. Glycerol forms a fundamental part of the lipids that hold your hair cuticles close together. The glycerol refills the holes in the lipid structure of damaged hair so that your lock of hair will look healthy, feel soft and shine as before. Anyway, it did the trick with mine! Not unimportant: pretty packaging and pleasant odor! Right after I wash out shampoo thoroughly, I smear this masque from ends to root progressively. I pay more attention to the ends. Simultaneously, I disentangle my hair which is made easier due to the coco oil. It also seriously ‘feeds’ your hair! I leave the masque in for 3-5 minutes and then again; wash it out thoroughly! 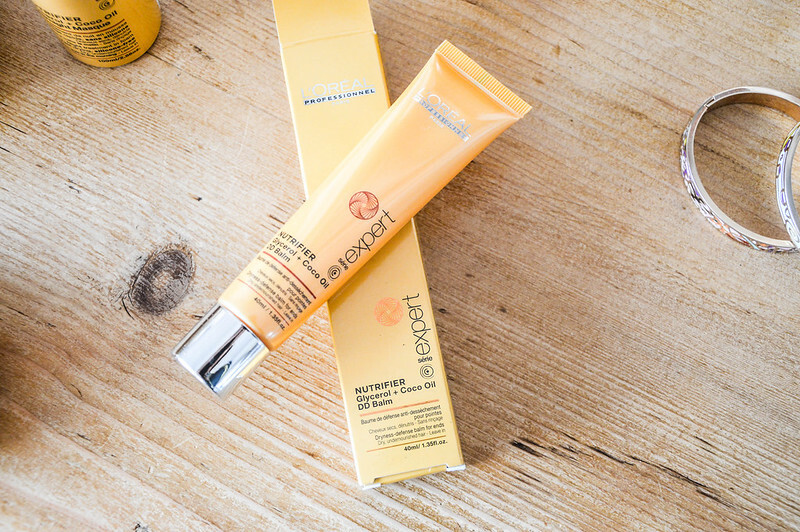 The next step (which I tend to forget, oops) is this nourishing balm. 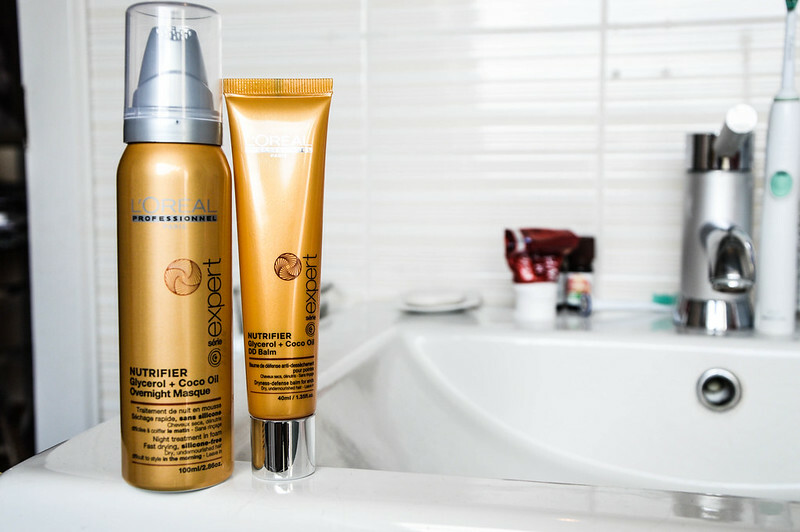 It’s formula is designed to extra-protect your ends against dehydration. It’s like a lipstick you always have with you in your bag; for continuous balminess and a luxurious feeling when touching your ends. No need to wash it out! This thing is a true wonder drug. 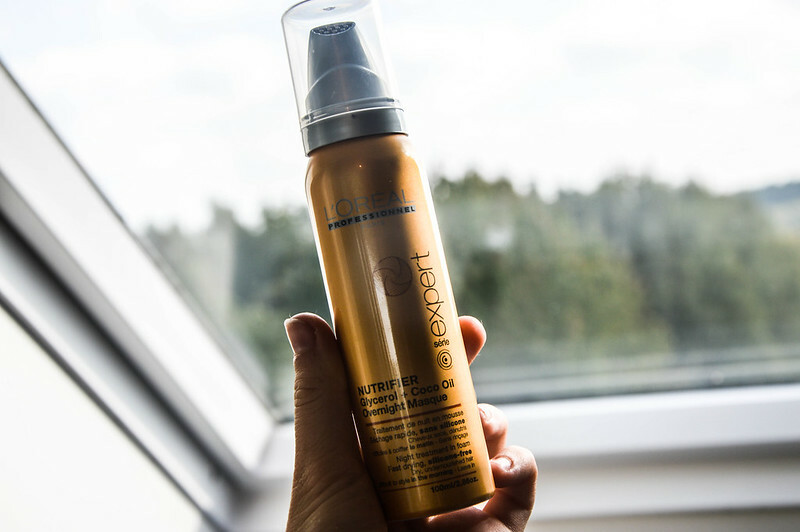 It kind of works like dry shampoo, but then with all the benefits of nourished, shiny, strong hair provided with it! 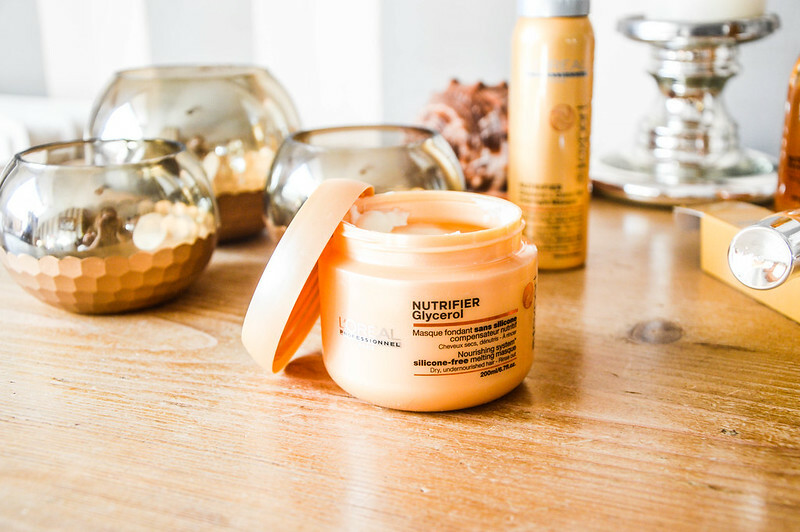 It’s an overnight masque that protects the hair against friction (due to the rubbing against your pillow) that again, opens up your hair cuticles. It comes in a mousse that when you apply it all over your hair, immediately dries in so you don’t need any towel to cover your head with. The next day I didn’t need to wash my hair and it stayed in unbelievable beautiful shape until the next day. A true rescuer when you don’t have much time in the morning! 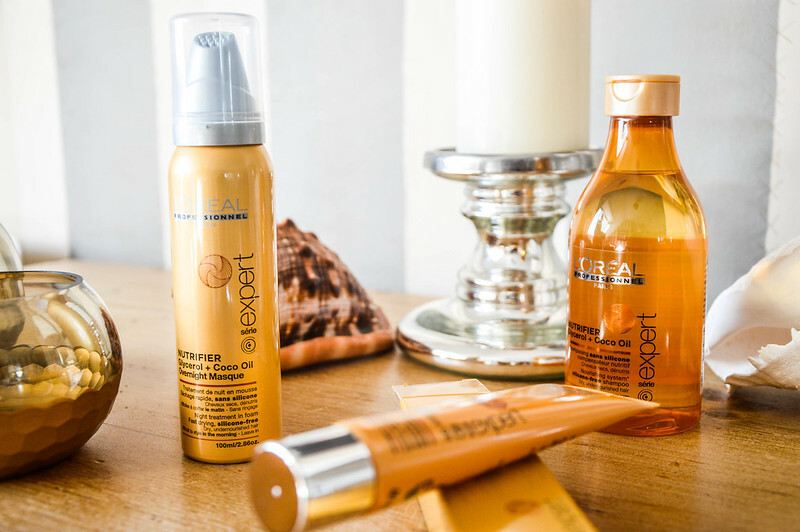 All products are exclusively available at the l’Oréal Professionel hairdressers. ❤ This post contains free products. However, I will never adapt my personal opinion on them because brands prefer positive reviews. My blogposts always contain own true findings about the things that end up in my mailbox. This only because I want to advise my readers in an honest and constructive way. Oh deze moet ik zeker eens proberen! Die zien er echt zalig uit .